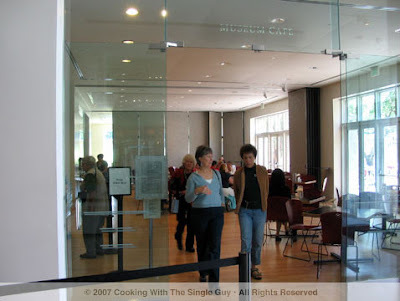 This is the fourth and final post in my special series looking at the cafés at major San Francisco museums. Café hours: 10 a.m.–6 p.m., daily except Wednesdays; open till 9 p.m. Thursdays. Access: Separate entrance right off street, no need to enter museum. Of all the museum cafés I’ve been visiting this summer, Caffè Museo at the San Francisco Museum of Modern Art comes the closest to resembling a true sidewalk café. Anyone who’s walked by the SFMOMA building across from the Yerba Buena Gardens in the South of Market area of the city can attest to the crowds generally found sipping coffee or tea in the café’s outdoor seating. 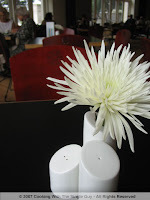 Not surprisingly, the café has a strong Italian influence but serves up dishes with seasonal California ingredients. The space is operated by Real Restaurants, whose other eateries include Betelnut on Union Street and Caffè Verbena in Downtown Oakland. I liked how the front counter is organized so that there are clear lines and more than one cashier to help you, which probably is nice at crowded times. The menu includes a variety of panini sandwiches ($9.50), pizza of the day ($8.50), salads ($10.95), pastas and other entrees ($11 to $14). They also serve wine, coffee and cappuccino. The décor inside is nicely suited to the museum’s modern tones, with contemporary art accenting the blond wood walls. My only gripe was that some of the tables weren’t as clean, which seems to be a problem among museum cafés. I visited Caffè Museo one day after work, so I got an early dinner. I started with the special soup of the day, Potato Leek ($6), and ordered the Pan-fried Crab Cake on Flat Bread ($12.95). The soup was served with this huge cornbread stick and was drizzled with truffle oil. I thought the soup was average, maybe slightly bland. I barely made out the added leek or truffle oil flavorings. It seemed to be mostly a potato puree. The crab cakes came on this large plate of flat bread topped with a green salad with radishes and cherry tomatoes. The crab cakes were nicely done, but again, nothing spectacular. It was filling and had a straight-forward vinaigrette dressing. Although, I did find it hard to eat the crab cake plus salad on top of the flat bread. Caffè Museo offers a decent selection of food that’s efficiently prepared, but I wouldn’t go as far as describing it as restaurant food like how it does on its own Web site. The space is a nice environment with the jazz music flowing, but the food, while decent, doesn’t match the same sophistication as the art on the walls. Admission is free on the first Tuesday of the month and is half-priced after 6 p.m. on Thursday nights. "Matisse: Painter as Sculptor"—I love the paintings of Matisse, with his whimsical colors and aggressive strokes. So I was surprised to see that he also did many mini sculptures of his work that translated into paintings. 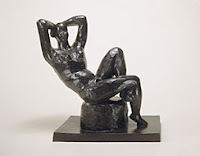 The SFMOMA currently has an exhibition exploring this connection between sculptures and paintings in this look at the two sides of Matisse. Exhibit closes on Sept. 16. 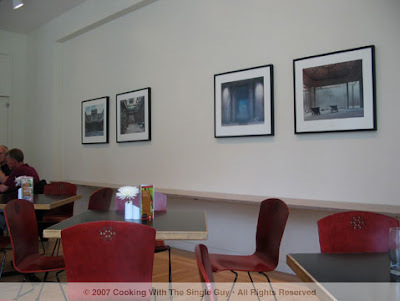 This is the third in a series of special posts all this week looking at the cafes at some of San Francisco's major museums. Café hours: 10 a.m.–4:30 p.m., Tue.–Sun. ; 10 a.m.–8:30 p.m., Thu. Access: Enter through museum main entrance where you’ll receive a special café sticker that allows you to dine without paying admission. Housed in the former public library building, the Asian Art Museum is huge. In 2001, it opened its doors at the current Civic Center location after years at Golden Gate Park. The collection of ancient and contemporary art is showcased in an open-air design by Italian architect Gae Aulenti—known for repurposing old buildings into art spaces, such as my favorite Paris museum, the Musée d’Orsay (a former train station). In almost an attempt to live up to the grand scale of the new Asian, the museum’s Café Asia seems to try really hard to offer a diverse and just as huge menu for visitors. Under Executive Chef Melinda Quirino, who has worked in the kitchen of the Hotel Nikko, the café menu is one of the more creative and heavy menus I’ve seen among museum cafés in town. During my recent visit, the menu listed offerings such as Japanese pork, Chinese Chicken barbeque sandwich, Vietnamese Pho Bo, Chicken Tikka Masala Curry, Prawns Stir-Fry and a Thai Coconut Chicken soup. It was a bit overwhelming for lunch. The café is a beautifully decorated space with about 60 seats. It has additional seating outside, which is especially nice when the weather is beautiful in the city. As you line up at the counter, there are several prepackaged salads, sushi and dessert. When you order at the counter, the line cooks start working on your meal so it’s made fresh. At Café Asia, you don’t get a number. So you wait at the counter until your meal is prepared—cafeteria style. This was fine on my day when there were fairly few people dining for lunch, but I wonder what this means for the line on days when there are a few more people waiting to order. Because I wasn’t paying attention, I didn’t realize that the Miso Salmon Sandwich came with a big side of garlic fries. (Dang those deep-frying gods!) In the photo, you can barely make out the sandwich, which seems dwarfed by the huge pile of fries. Luckily, it also came with a nicely pickled Asian-style cole slaw. The salmon was underwhelming, and it was placed in a bun that was a bit tough to eat. The salmon was basically shredded, like it came from a can, and I barely tasted any trace of miso. It came with watercress and Roma tomatoes, and I was so disappointed that I resorted to just eating the fries. The hot dog was nice, but it wasn’t as amazing as my co-worker built it up to be. I wouldn’t travel all the way to the museum just to get this hot dog, although it was smoky and full-flavored. The bun, again, was a bit stale and tough to eat. The only really memorable part of the dishes I ordered was the pickled cole slaw, and only because I really like pickled vegetables. I could eat a whole plate of the slaw, but then I’d probably get a tummy ache. Café Asia has a tempting menu, which is probably more appropriate if you’re really hungry or eating an early dinner. The execution is inconsistent, and with so many great Vietnamese food nearby in the Tenderloin, it might be smarter to eat in the neighborhood. The museum is open late on Thursday nights, and admission is half-off when you enter after 5 p.m. (Just $5 for adults.) On the first Thursday night of the month, the museum’s young and hip MATCHA group puts on an evening of live music and demonstrations. Check the calendar for upcoming MATCHA events. Among the various special exhibitions this summer at the Asian Art Museum is this collection of Japanese woodblock prints. I love Japanese woodblock prints for its bold graphic design. 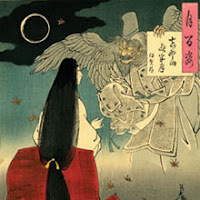 Many of the prints often relate to Japanese folklore or ghost stories. For example, the current exhibition entitled “Yoshitoshi’s Strange Tales: Woodblock Prints from Edo to Meiji” deals with the subject of the supernatural during the westernization of Japan during the Edo and Meiji eras. If you love block prints as much as I, you have to hurry and go this weekend because this special exhibit ends on Sunday, Sept. 2, 2007. 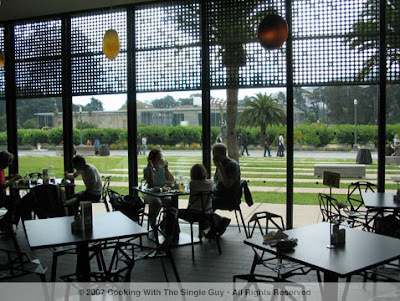 This is the second in a series of special posts this week looking at cafés at some of San Francisco’s major museums. Café hours: Tue.–Sun., 9:30 a.m.–4 p.m.
Access: Enter main museum entrance and pay $10 deposit (same price as an adult admission) and you get 40 minutes to eat in the café downstairs. Then return to the front to get your $10 back. 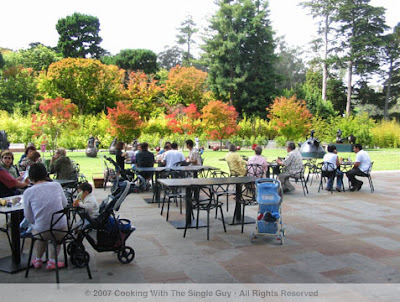 When I went to the Legion of Honor’s Web site to find out more about its café, the page said to come to the café and enjoy “a coffee break, lunch, or afternoon tea” with a view of the Golden Gate Bridge. The idea of afternoon tea on a beautiful weekend day was enough to convince me to catch the BART and transfer to two MUNI buses to get to the Legion—one of my favorite and probably most photographed museum in the city. After paying my admission (you can also just leave a deposit if you’re only going to the café), I headed downstairs to the café. Ironically, I noticed that the menu was printed on the same paper as the menu I found at the de Young café at Golden Gate Park. And as I read the menu, it was very similar if not identical to what the de Young served. So basically, whatever I said yesterday about the food at the de Young will probably apply to the Legion. Turns out the Legion of Honor is in the same family of museums as the de Young. 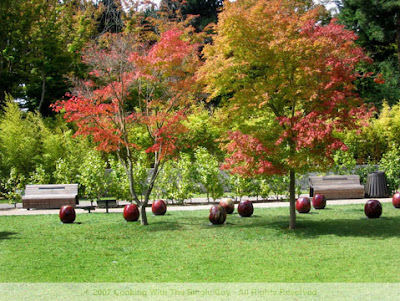 (The group is called the Fine Arts Museums of San Francisco.) So it’s probably no surprise that the group hired the same catering company to operate its museum cafés, the Bon Appétit Management Co.
As I tried to decide what I was going to order, I was really disappointed to see that there weren’t any special items for “afternoon tea.” I was expecting a nice assortment of teas and maybe some scones or tea sandwiches. Instead, it was the typical salads, soups, sandwiches and entrees like the de Young and a box of tea bags from Peet’s Coffee and Tea. 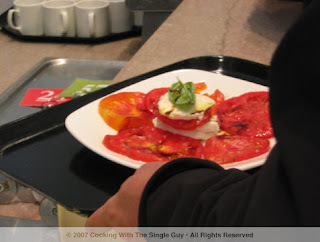 While I was standing in line, the person in front of me ordered a Caprese salad, which is made at the counter as you wait. I wasn’t in the mood for salad, but I have to say the heirloom tomatoes looked so brilliantly red that I had to sneak a photo of it. After getting another cup of tea, I waited for my pasta. When it arrived, it came in the same tilting bowl as my soup at the de Young. 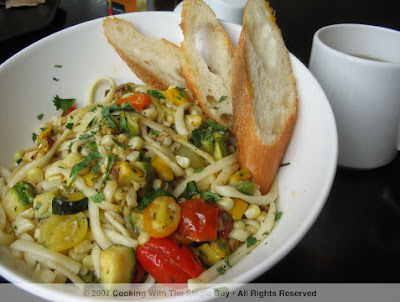 The Summer Pasta was linguine topped with toybox squash, cherry tomatoes, sweet corn and some herbs in a light extra virgin olive oil sauce. It came with three slices of French baguette that had very slight smudges of what looked like cheddar cheese. The pasta was conflicted—the linguine was overcooked to the point of being plump and soggy while the vegetable blend was a refreshing taste of summer. I was so angry that they couldn’t cook the pasta right in order for me to enjoy the freshness of the vegetables, which provided a natural juice as the sauce for the dish. I envied the guy who was smart to just order the Caprese salad. I mean, how wrong can you go with brilliantly red heirloom tomatoes, mozzarella and basil with just a drizzle of olive oil? The Legion of Honor café, obviously, offers the same menu as the de Young. How it differs, IMHO, is in the execution and the overall tired feeling of the room, which unfortunately could be a sign of the times for this older museum. The museum itself is still one of my favorites for its art collection and beautiful surroundings, but the café can only be counted on for its salads or sandwiches. That’s unfortunate since the museum is up a hill and you’re far from any other alternatives for food. You’d think I would give the Legion the same rating as the de Young since it’s run by the same catering company. But I’m dinging it a notch because of the overall lack in execution. If you’re looking for a Fine Arts Museum café, just stick with the de Young. For the summer, the Legion of Honor is offering “Summer Sunday Brunch” and the month of September will feature live jazz performances from 11 a.m. to 3 p.m. It’s a prix fixe menu for a steep $48 for nonmembers (but that includes admission to the galleries after brunch). After my experience, I can’t say I would recommend it. But if Sunday brunch with jazz at a museum sounds fun to you, check out the calendar. “Rembrandt to Thiebaud: A Decade of Collecting Works on Paper” is a special exhibition of the museum’s vast graphics collection that’s part of the Achenbach Foundation for Graphic Arts. The exhibit is currently running until Oct. 7. 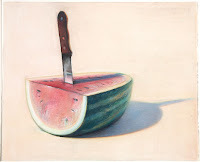 My favorite piece of the collection is this one by pop artist Wayne Thiebaud called “Watermelon Slice and Knife.” Isn’t it perfect for foodies? This is the first in a series of reviews all this week looking at cafes inside San Francisco’s major museums. Access: Side entrance outside of museum allows for easy entry without admission (be prepared to have your bags checked). I’m a big believer of living in the now, instead of the past. That’s why when I decided to visit the many museums in San Francisco and test out their culinary exhibitions, I decided to start with the youngest museum with the richest history. The de Young museum was founded in 1895 in Golden Gate Park, but it went through a major rebuilding and renovation and two years ago reopened with a lavish party and a bold new look designed by architects Jacques Herzog and Pierre de Meuron of Basel, Switzerland. While the bronze shell reminds me of some rusting ship, the new de Young has firmly retaken its claim as one of the most innovative modern museums in the country, if not the world. 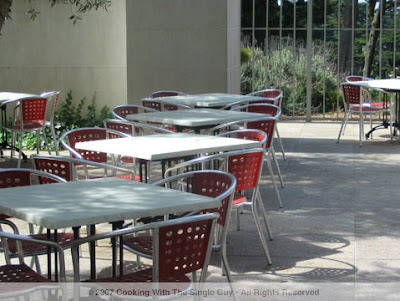 Serving the many visitors is a bright café on the ground floor with enormous outdoor seating. 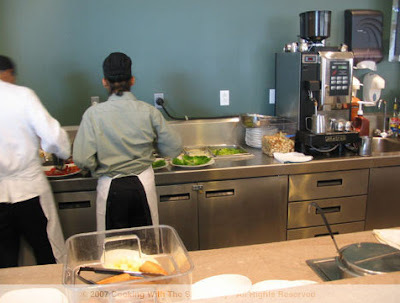 Operated by locally based Bon Appétit Management, the café features a daily menu of salads, sandwiches, soups, entrée dishes and a children’s menu. It also prides itself as being part of a “farm to fork” program where all ingredients served come within 150 miles of San Francisco. 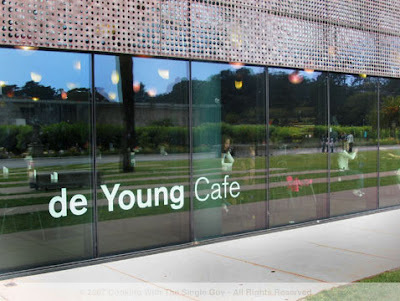 I visited the de Young café on a Sunday morning and was pleased to see the café wasn’t packed with the huge lines that engulfed it when the museum opened back in October 2005. 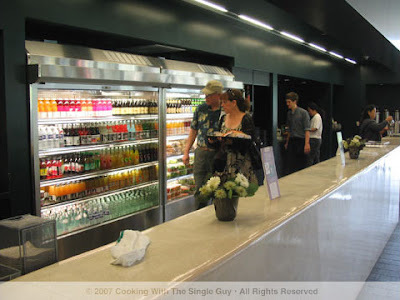 Still, the café layout is ready for large crowds with cashier counters on opposite sides of the room and bottled drinks and refrigerated pre-packaged options readily accessible as you go through the line. But here’s my best advice for you: Never buy a pre-packaged food item no matter how long the wait may be for a made-to-order dish. The café charges you the same price for the pre-packaged salads and sandwiches as they do for ones you order at the counter. So you basically end up paying the same amount for something that’s been sitting for awhile as opposed to getting something freshly made for you. I learned that lesson once with a wilted pre-packaged Caesar salad that I paid $10 for. 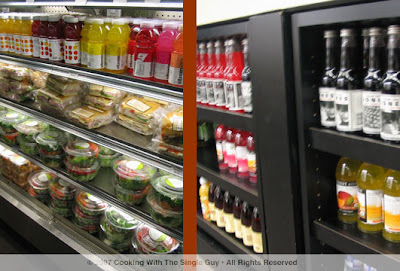 During this visit, I quickly skipped the refrigerated section and went straight to the counter to order my lunch. The menu features a large selection of salads, including a flank steak salad and a roasted shrimp salad with cherry tomatoes and beans. For the entrees they offered a salmon dish and a Roma pasta selection. For the kids, you get your basic peanut butter-jam sandwich, spaghetti, grilled cheese and chicken skewers. I ordered a smoked Diestel turkey sandwich and the soup of the day. When my food arrived, my soup was in one of those tilted looking bowls that was very artsy in itself but made me nervous about spilling. The soup of the day was a split pea with vegetable. 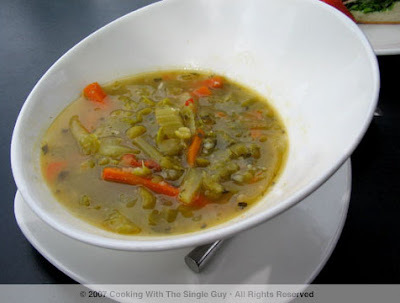 I actually imagined a beautiful green soup puree but I got a hearty clear broth soup that reminded me of lentil soup. Although it wasn’t what I imagined, it was tasty and enjoyable. 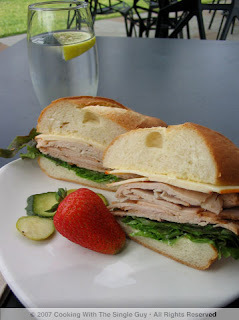 My turkey sandwich was made with Muenster cheese, leafy lettuce and a simple Dijon-mayonnaise sauce. I didn’t know what kind of bread it was served on, but it was piled on high with turkey almost like a deli sandwich. (I say almost because a real deli sandwich would be much taller.) I didn’t find the turkey sandwich to be anything remarkable, but I did like the freshness of the meat. The turkey was tender and tasty—a clear sign that the café was serving quality ingredients. The café prices are similar to what you would find at other museums: salads ($10–$14.50), sandwiches ($9.50–$10), soup ($4), and entrees and burgers ($9.50–$15). While the menu isn’t innovative like the museum’s cutting-edge design, it offers fresh, quality ingredients in a calming environment that will be a nice cap to any museum visit. Now until November 23, the de Young is open late on Fridays for special “Friday Nights at the de Young” events featuring live music, poetry, lectures, movies and food. Check the museum’s Web site for schedule of events. Peter Max and the Summer of Love, Aug. 31–Oct. 28, 2007. 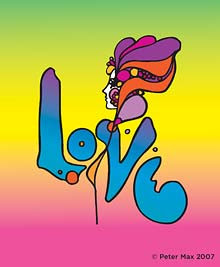 To commemorate the 40th anniversary of the Summer of Love at Golden Gate Park, the de Young is putting on this special exhibit of the pop poster art of Peter Max. Park festivities commemorating the anniversary are set for Sept. 2. COMING UP THIS WEEK: Starting Monday, I'll be doing a special series of posts on museum cafes in San Francisco. With the exception of New York and most European cities, San Francisco has some of the best museums to explore. But do the museum food match the reputation of this city's culinary brilliance? Well, check back tomorrow and see. MY COMCAST AND MAC AREN'T SPEAKING TO EACH OTHER: I think we take technology for granted because things general work so well. Until they don't. Last week my 3-year-old Mac stopped talking to my Comcast high-speed cable modem, so I couldn't connect to the Internet. What? So how am I posting? I'm actually connecting to my cable modem with my old PC laptop from Dell. (Good thing I didn't sell it or donate it.) I'm telling you all this because the frustrating calls to Apple support and dealing with what is apparently a corrupted ethernet has distracted me from cooking and creating new recipes. So my apologies for not posting more recipes than I normally do. But I have been cooking with the season's sweet corn (mmm, made a corn chowder last week) and brilliant red tomatoes. I promise to post new recipes soon! For now, just check out the 93 recipes I have in my archives! The place I typically go for gelato is Naia, an Ikea-looking gelateria founded only a few years ago by some Bay Area folks who felt they couldn’t find good gelato to match the ones they ate on their travels. (I like those type of people. Bringing world food back home to the Bay Area.) Naia has been featured by several local news programs for its fresh, seasonal flavors made primarily of local ingredients. It’s been a few years since I’ve dropped by Naia for a cup of gelato. When I entered during this recent visit, I thought Carmen Miranda had exploded behind the counter. On every bucket of gelato flavor were the actual fruit or food product that inspired the flavor. I don’t remember this display when I was here a few years ago, and I felt it just raised the cheese-factor up a notch. Getting over my aghast over the counter display, I started to zero-in on my choices. I first tried the Black Mission Fig. I thought: Seasonal and I love figs. I don’t love it as gelato. It had an odd meaty taste. I was tempted by the watermelon, but I was pretty sure I had that flavor the last time I was here and I had just made a whole tub of watermelon granita a few days before. I asked the guy behind the counter for help. He said Nutella was his favorite. I tried it and it tasted nutty and not too sweet, but nothing spectacular. I thought I’d go a different route and went past the fruits and looked at the Italian-inspired flavors, trying the Canoli. It didn’t have the sweet taste of dessert, but instead tasted like simple vanilla ice cream. I’m not the type to stand there trying one flavor after another at an ice cream store. (I’m usually the guy stuck behind that person.) Luckily I was the only one at the store at the time. Still, I thought this wasn’t a good sign that I couldn’t find a flavor after all these tries. I ended up taking a leap of faith and selected the Mojito (because I’m on a mint kick right now) and the Plum (because it had such a pretty color, almost like the Flavor King!). I got two scoops in a medium cup ($4.50). The Mojito turned out to be quite tart, almost like lime. It was definitely minty, but I could barely finish it because of the tartness. The Plum was sweet and refreshing, but it was too sweet. If you’re the type who like to mainline sugar, you’d probably enjoy it. I didn’t. Also, the overall texture of Naia’s gelato is more liquid than creamy, and not as rich as gelato I had in Italy. I can’t decide if the quality of Naia’s gelato has gone down hill since my last visit two years ago, or if there just happens to be better options these days such as Gelato Milano in Berkeley, which serves creamy gelato with well-balanced taste profiles? Either way, Naia might be my go-to place for a gelato if I just happen to be in the Castro. But it’s not a destination place like Bi-Rite, Ici, or the aforementioned Gelato Milano. Hmm, maybe the Naia owners need to hit the road again and taste some better gelato. Few food products live up to their names. But when it comes to the pluot variety known as “Flavor King,” it is richly deserved. This is no prince of pluots, Flavor King rules. 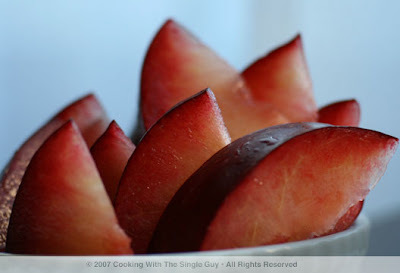 In case you’re not familiar with a pluot, it’s the stupid hybrid name for a plum and apricot. But when I eat it, you know what I think of? Plums. What’s even more confusing is there’s a hybrid of an apricot and plum, called an aprium. Really, was that necessary? Anywho, I’m calling a plum a plum. 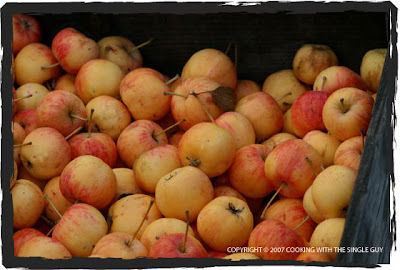 In Hawaii, we never had the greatest plums because they were shipped in from the mainland unripened, so they were tart. I don’t think I knew anyone who could grow plums in their yards in Hawaii. Living in the Bay Area, summertime mostly meant peaches, strawberries, cherries and grapes. They were enough to fill my fruit appetite. Or so I thought. Curious about the Flavor King when I saw it recently at the farmers’ market, I tried a sample the people at the stand had cut up for taste testing. It tasted so good, so different than any fruit I’ve had before, that I bought a bag home and have been treating myself to one every night. What I love about the Flavor King is its subtle sweetness and beautiful color. First, the flavor. It’s sweet, that’s a given. But it’s a disservice to just say it’s sweet. It’s this ethereal sweetness that’s a little like rose water—fragrant and slightly sticky. Yes, it’s like perfume. I would bottle its juices and put some behind my ears if those dang ants would stop biting me. 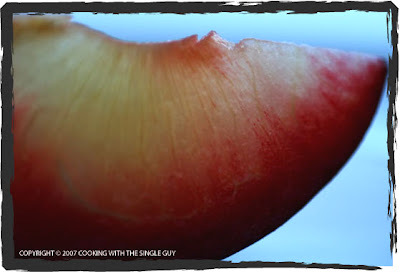 As you can see in the photos above and below, the flesh of the Flavor King is amazing. It turns from a firm apricot orange (OK, so I guess it is part apricot) to this pinkish-red color that is quite beautiful on the plate. The more red the flesh, the more sweet and soft. You can still eat it firm when it’s more orange, but that would mean it’s less sweet and more firm, if that’s your preference. On the outside, it looks like any other red plums, with just a tad shade of purple. So keep your eye out for the Flavor King when this variety is in season. It’s a regal treat. So what did I do with the rest of the bottle? Duh, I drank it. Bubbly doesn’t last very long and there’s only so much granita one can eat before one gets a brain freeze. That’s when I used my remaining watermelon puree and a bunch of mint to create a refreshing summer drink. Not feeling creative, I’m just going to call it my “Melonito” because I think it’s similar to a mojito because of the mint but not really. Enjoy! Create your watermelon puree by chopping up a seedless watermelon and placing the chunks in a blender (or use a hand blender). You can strain your puree if you want it to be smoother. 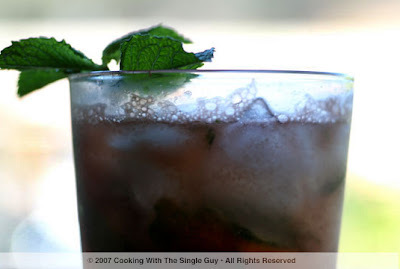 In a glass, throw in a bunch of mint leaves with the sugar, and then “muddle” the leaves to bruise them and get the mint oil going. (If you don’t have the fancy wooden mortar used in bars, just use a wooden spoon.) Add ice cubes, watermelon puree and top off with Prosecco. Stir a bit to get the sugar dissolving. Garnish with a mint leaf. TIP: I used Italian Prosecco because it’s one of the cheaper sparkling wines around. But you can substitute with any other sparkling wine. If you want to make this a non-alcoholic drink, then use something bubbly like Ginger Ale or club soda. UPDATE (10/03/09): This store has closed. I guess that answers that. On Sunday I was strolling the Castro district in San Francisco. It had been awhile since I've been in the neighborhood, so I checked out some of the new things such as this chocolate candy store named, appropriately, Chocolate on Castro. It's funny that during the time I was there in this new Castro store, I was the only guy there. All the workers were female and all the browsers were women as well. So do gay men really eat chocolate? Probably, but I always had the theory that women go ga-ga over chocolate more do men, even gay men. Am I right ladies? So we'll see how long this store lasts. Granted, the Castro is changing and it's no longer just a gay neighborhood as more and more straight couples move in. But it's still predominantly men. 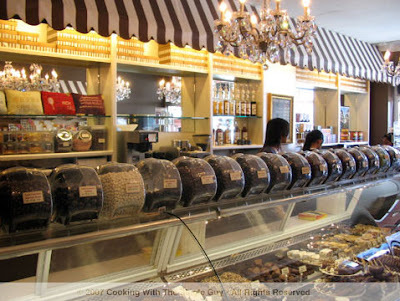 Above you see the counter that has all the variety of chocolates like truffles, coated candies and fudge. 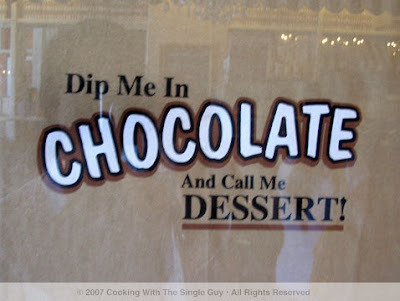 They sold a lot a chocolate novelty items such as chocolate pasta, chocolate sauces and chocolate-themed T-shirts such as the one shown above. 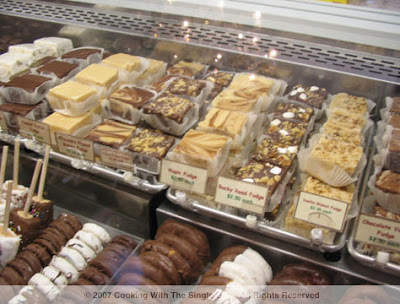 Here's their home-made fudge. They had all sorts of flavors. I decided to try the mojito fudge, which sold for $2.50. I have to say, I've never eaten a lot of fudge in my life so didn't know what to expect. I thought it might be more like brownies, but it was actually softer and thick, sort of like a chocolate mousse. It definitely had a minty flavor. I liked it although it was a bit too sweet for me. 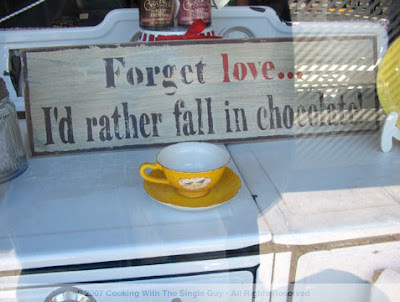 But something tells me that most chocolate lovers probably love the sweet. 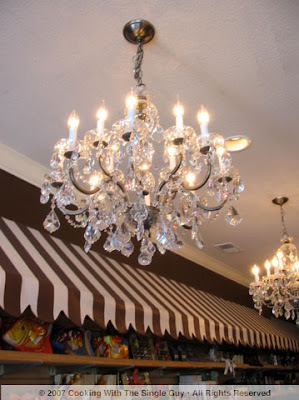 Throughout the shop were these huge chandeliers. I kind of liked them in that shabby chic kind of way. My take on this store is that it's a novelty chocolate candy store, but not all the chocolate have the appearance of premium chocolates like Rechiutti at the Ferry Building, for example. (Of course, you're also not paying the crazy Rechiutti prices either.) The chocolates (with the exception of known brands like Charles Chocolates) had this real homemade look. Also, the service was pleasant but a bit curt. They didn't seem to want to strike up a conversation as much as getting your order and moving on. Not something that will bode well in a neighborhood location. Chocolate on Castro, 504 Castro St. at 18th Street, San Francisco. 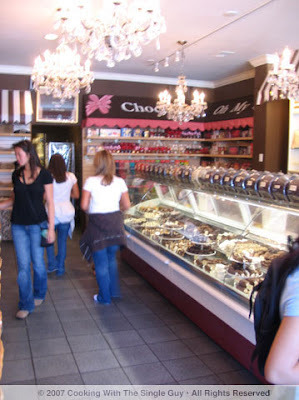 BTW, found this great blog about the comings and goings of businesses in the Castro. It's a shame that there is such a high turnover in this neighborhood. It's odd because gay men have a lot of descretionary income but they apparently spend it everywhere BUT the Castro. Go figure. Anywho, this blog is a fun read.